People love fish out of water stories. In her first book, In the Land of Believers, Gina Welch straps on the scuba suit and tries to live with the fish. While growing up in Berkeley and attending college at Yale, Gina had heard all about “evil evangelicals” and their agenda to conquer American society, force their religious views on everyone, and mandate public prayer to Jesus only. 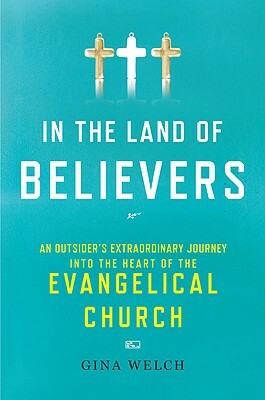 When she moved to Virginia to attend graduate school, she knew she was entering the heart of Red State evangelical fervor and hoped to educate herself by reading a “fleet of books by liberals out to dissect the evangelical body politic” and New York Times reports on the weird practices of these fundamentalist Christians. 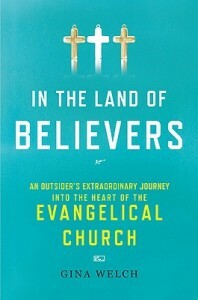 But after living in Virginia for a short time, where a third of the population is “born-again”, she felt a disconnect between the liberal reportage on evangelicals and the people themselves. The caricatures didn’t fit the characters, and she needed to find out which side was right about these Christians. She “wanted to know what [her] evangelical neighbors were like as people, unfiltered and off the record, not as the subjects of interviews conducted by the ‘liberal media.’” (5) The best method, she surmised, was to pretend to become one of them—so she got “saved”, was baptized, and even went on a missions trip with the right-wing fundamentalist evangelicals of Jerry Falwell’s Thomas Road Baptist Church. Her journey begins like the life of a newborn calf—clumsy and awkward as she stumbles about, searching for the strength in her legs. Unsure of what to wear, how to speak, or even where to go, she trips her way through the “front door” experiences of the church until she hits her stride with EPIC, a ministry for singles. At EPIC she made friends with other young single women, fended off awkward advances from single men, and even went on a weeklong missions trip to Alaska. Her prose is engaging and honest. I couldn’t put the book down, finally finishing it in one sitting at 2am on my birthday. Gina treats the people she met and came to be friends with honorably, exercising no vendetta, neither caricaturing nor whitewashing. We see them as they are—evangelistic, hopeful, Christ-centered, prayerful, homophobic and staunchly conservative. I came away with a great deal of respect for my fundamentalist brothers and sisters. They seem to be far more faithful and committed Christians than myself. Gina’s journey from suspicious unbelief to sympathetic unbelief is fascinating to watch as it unfolds. In the midst of her deception she seems to have authentic encounters with God and discovers a genuine love for the friends she has made. She even found herself grieving over the death of Jerry Falwell! In many ways this is one of the saddest books I’ve ever read. It’s sad because Gina had authentic experiences with God while living a lie, and because of her deception she couldn’t see him in those moments. It’s sad because her deep friendships were a sham, but her friends didn’t know it until much later. It’s sad because her words make me long for the warm, safe cocoon of fundamentalism, where the world makes sense and there’s an answer for everything. The people she deceived were flawed but good, limited in their understanding and yet full of grace and forgiveness. They truly cared for nonChristians, and though they’ve been hurt by her, I suspect they still truly care for Gina. On one level I’m deeply grateful that Gina wrote this book, as it helps to destraw the evangelical strawman, and replaces him with flesh and blood people. I wish she could have gone about this project without such sustained and profound deception, but as Alice says after discovering the lies, “You wouldn’t have known if we were being real with you.” (326) Do the ends justify the means? I don’t think so. But the ends are still important. Though Gina Welch swam with the fish for two years, she never managed to remove the oxygen tank. But I still hold out hope that someday she’ll learn to breathe underwater. Questions: What do you think of the ethics of living undercover with a group of people in order to understand them? Do the empathetic ends justify the deceptive means? What does Gina’s book contribute to the cultural conversation at large? Can atheists and Christians, conservatives and liberals, learn to get along through empathy and mutual understanding?